Social Sculpture for Individual Goals is a ‘support group’ (one of our culture’s ‘tropes of self-transformation’) approached as an art form. I developed this idea following my experiences with 12-step programs, psychotherapy groups (both as a psychologist and as a patient), and other types of support groups. I began to realize that some of these groups tend to be dogmatic and to revolve around the idea of a fundamental flaw within the self. Also, I had concerns with how some of these groups were structured, e.g., sometimes certain people would be allowed to talk more while others would have less time or not even be allowed to talk at all. In 2013 I found some other people who shared some of my ideas and with them began to run the kind of group that I wished existed, and together with them I developed some of the concepts and procedures that eventually led to the Social Sculpture for Individual Goals. I proposed my idea for the Social Sculpture for Individual Goals (note: ‘social sculpture’ is a term coined by 20th century conceptual artist Joseph Beuys) to the Arts Committee of the Religious Society of Friends of the Truth (also known by the nickname ‘the quakers’) that meets at 15th Street in Manhattan, and they expressed interest in the project and agreed to sponsor it on an ongoing basis beginning in January 2018. 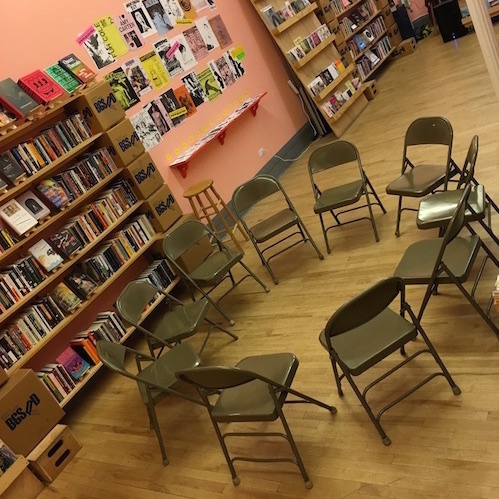 A second iteration of Social Sculpture for Individual Goals began in January 2019, in collaboration with the Bureau of General Services—Queer Division, an independent, all-volunteer queer cultural center, bookstore, and event space hosted by The Lesbian, Gay, Bisexual & Transgender Community Center in New York City. I would like to develop an online extension of the Social Sculpture for Individual Goals project. The idea is that it would be somewhat similar to Facebook, but more structured. Unlike Facebook, this would not be a place to rant and get into arguments; rather, the primary purpose would be to publicly share one’s personal goals and to give and receive social support to one another as each person works towards their individual goals. Users would be able to post and share their daily routines, rituals, schedules, etc., so that we could all learn from each other about ways to better structure our lives. This project could possibly involve collaborations with preexisting online services, such as Google Calendar and maybe even Facebook (though I would prefer that it be separate from Facebook). I would like this website to be fun and to be ‘gamified’. For example, one idea I have is that there could be a ‘group dinner’ function that facilitates groups of users who are dieting individually to Skype together for meals, based on a shared media interest. For example, I personally enjoy watching art documentaries while I’m having my dinner, so on the site there could be a way for someone to ‘start a group dinner’ by choosing an art documentary to watch, and then other users who are interested in watching that same documentary while having dinner together could Skype into the group and have a shared experience together. Participants in the group dinner could type in their reactions to the documentary while they eat, to create a feeling of community while enjoying the documentary together, even as they enjoy their meals separately in their own homes. Perhaps there could be a collaboration with various media companies (e.g., Netflix) in the development of this service. Various types of media could be offered, including television shows, movies, documentaries, audio books, inspirational talks, YouTube videos, etc. I would also like this site to be used to facilitate in-person meetings, e.g., in-person group dinners, in-person meetings of the Social Sculpture for Individual Goals (like the one I am currently facilitating with the Religious Society of Friends of the Truth), etc.